A few simple steps can save property owners thousands of dollars of damage due to structural mold growth, according to Doug Hoffman, Executive Director of the National Organization of Remediators and Mold Inspectors (www.NORMI.org), a nonprofit organization involved in providing training and certifications for mold and indoor air quality professionals. Taking the necessary steps to avoid structural mold growth will not only preserve the integrity of a building but also the health of its occupants, further explains Kurt and Lee Ann Billings, authors of the book MOLD: The War Within, which details lessons learned from Katrina. Remove standing water - remove wet carpets, rugs, draperies, personal belongings (if possible) and exterior mulch against the foundation walls, etc., to allow the subflooring and foundation to dry. Dry the structure out as quickly as possible - this is the most important thing you can do as structural mold will begin to form in the first 24-48 hours. Remove water-saturated sheetrock 18 inches above the highest watermark to increase structural drying. Turn up the heat and use a dehumidifier - when drying out a structure and/or its contents, reduce the indoor humidity to less than 60% and use heat to speed the drying process. Hot, dry air dries things faster than cold moist air. Circulate the air - turn on fans and dehumidifiers or open windows if there is no electricity to get air moving around to increase drying. Don't seal it up until its dry - siding, sheetrock, and flooring repairs should be done only after the substrates are completely dry. Only use plastic to prevent further water damage. Don't use bleach - it is an effective sanitizer but will not remove mold at its root. The mold will look like its gone but it won't be. Inspect windows on the outside of the structure - check for possible water seepage through the caulking/seals. Remove all mold growth on building materials by mechanical means - such as sanding or complete removal. Use sanitizers - on any portion of the structure contaminated by sewage or flood waters. To ensure a healthy flood cleanup, identify the tasks you can do yourself and then locate qualified professionals to do the ones you can't, recommends Doug Hoffman, Executive Director of the National Organization of Remediators and Mold Inspectors and author of Mold-Free Construction. Recognizing if you are in a high-risk health group is the first step in protecting your health when your home, workplace, or school has become water damaged from flooding, explains Kurt and Lee Ann Billings, authors of the book MOLD: The War Within, which details lessons learned from Katrina. Many people are completely unaware that their health histories put them in a high-risk category for exposure to structural molds until it is too late and they are already sick, which is exactly what happened to the Billings family. Prevention of health-risking exposures is paramount when in a wet-building environment because the species of mold that grow on it also produce toxic poisons called mycotoxins. By being aware of the following DOs and DON'Ts, flood area residents will be able to make informed, health-focused decisions. Don't perform remediation tasks if you fall into one of the CDCs high risk groups. To best protect your health and property, hire a trained mold professional. Do take the CDCs high-risk group warning seriously. The health of a seemingly 200 lb. strapping young man in his 20s or 30s can become compromised when exposed to mold even if he only has a health history of allergies. Don't, especially if you fall into one of the CDCs high risk groups, live, work, or go to school - if at all possible - in a structure that has been flooded or suffered water damage until it has been properly remediated and passed final clearance testing. Do wear personal protection equipment (PPE) when entering a mold-contaminated structure for even a short duration of time. Don't think that personal protection equipment (PPE) is going to be enough to protect you if you are in a high-risk group. Studies show that spores and spore fragments easily penetrate N-95 and N-100 facemasks. Do use a HEPA air purifier to reduce indoor airborne mold spore counts. Don't use any air purifier as a long-term solution instead of proper remediation. Do use a HEPA air purifier that is sized properly for each room. Don't expect the HEPA filter to last as long in a mold- and bacteria-contaminated environment as it would under more normal conditions. Do at least create a "clean" sleeping room if a HEPA air purifier can't be placed in each room. Don't think that a clean sleeping room is as good a solution as sleeping somewhere else that did not experience water damage. A well-known expert, when interviewed on a local New Orleans radio station, recently said, "When you have a mold problem, simply wash down the affected area with diluted bleach." We have seen FEMA handing out gallons of Clorox to flood-victims. Lowe's and Home Depot stock up pallets of the stuff whenever the impending doom of a threatening hurricane is close. This is one of the most widely publicized "urban legends". Bleach is a powerful oxidizer and can, in many instances, sanitize surfaces of certain types of bacteria but when you are faced with a wall covered in mold, bleach is NOT the product to use. Eyebrows raise in disbelief every time I say the phrase "bleach doesn't kill mold." Some look at me as if I'm speaking another language and they are right. I am speaking the TRUTH. Bleach (active ingredient is Sodium Hypochlorite) is very effective in removing the discoloration but may leave the microflora that will enable the mold to return in exactly the same spot when conditions are right. So, "how do you know this," I'm asked. Several years ago we helped develop a process by which shingle and tile roofing systems could be cleaned of the mold and mildew that plague them. 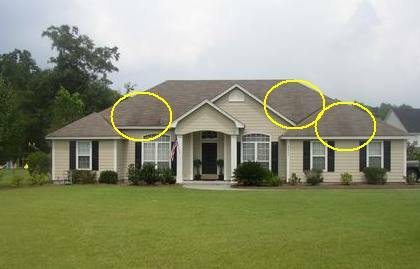 Look at any Real Estate guide or website that lists houses for sale and you'll see house after house with mold streaks running down from top to bottom of the roofing system. The mold on the roof looks ugly but that was not our biggest concern. Mold on house roof. There are two bigger concerns and, therefore, reasons to address this roof mold problem. 1) It destroys the shingle and, 2) it makes your air conditioning system less efficient. First, shingles are made, primarily, of organic materials. The asphalt or fiberglass content in a shingle is only a small percentage of the entire composite. This organic material is ripe fruit for the mold to eat. As we all know, mold needs to have a nutrient of some sort and organic materials are especially appealing. The petroleum-based asphalt is protected from the UV light of the day's sun by a "ballast" or granules that are "glued" to the surface of the shingle. When the mold begins to grow it "pops" the granules off of the shingle exposing the asphalt to the UV, thus shortening the life of the shingle. When shingles begin to curl, that's a good sign that the shingle is drying out and its life is ending. Cleaning the roof off using an effective biocide will lengthen the life of the shingle by allowing the granules to remain tightly adhered to the surface. Secondly, a black roof absorbs more heat than a lighter roof. Interestingly enough, in Florida, most homeowners choose a lighter roofing color for that very reason and yet, after a few years, they all end up the same color - black. We commissioned a study once in conjunction with the University of South Florida and found a substantial difference in attic temperatures once the roof was cleaned and the original lighter color was restored. I mean 30 degrees or more. That means by simply cleaning your roof to the lighter color you could make a major difference in the attic temperature and that would allow your air conditioning system to function more efficiently. In most cases the attic is the insulating space just above the air conditioned space so having those temperatures reduced substantially lowered the air conditioning bill. The importance of understanding these problems make it relatively easy to sell the customer of the value of having their roof cleaned. However, what product or products to use could make a substantial difference in the longevity of the cleaning process and the effect of the cleaning process on the roofing system. Of course any time of high pressure wash could destroy the shingle by removing the granules so a low pressure wash is desirable and that makes the chemical solution you use more important. We used a combination of surfactants, detergents, and BLEACH (sodium hypochlorite) to lightly spray on the roof then rinse it off with no more pressure than a garden hose. It worked great. Only problems were that the landscaping had to be protected from the toxicity of Clorox and the mold would return in less than two years. Even walking around on the roof every couple of years could damage the roofing system so we looked for a better alternative. Anecdotally, my wife wonders why she has to clean the same spot of mold on the bathroom tile month after month. Now she knows why. The mold has never been killed - it simply goes clear and then returns. Bleach will not kill the mold but a good biocide, or anti-microbial, will. To underscore the validity of my claim, I suggest the "Journal of Forest Products" who commissioned a study by Oregon State University a couple of years ago. We have this article on our website where we have posted the abstract and the results. The "implications" of their testing showed exactly what we have been training for years. The stain disappears but the microflora remains and under the right conditions the mold will begin to grow. In our Sanitization Protocol we recommend using GREEN technologies to remove surface mold. When you use the right kind of anti-microbial, the mold will be destroyed and the underlying bio-slime will be annihilated. I wish we had known about these kinds of technologies ten years ago when we were cleaning roofing systems. Instead of spending so much time protecting the landscape, we could have done an additional job or two. We could have completed more jobs and our subsequent warranty workload would have been reduced.